Learn about the World’s FIRST, fully solar-powered golf cart. The Golf cart industry has changed very little over the years with the development of new technologies. A brand new golf cart today looks much the same as one produced many decades ago. While some manufactures have recently partnered with lithium battery companies to extend the life of batteries, none of the manufacturers have ventured away from the usual large heavy 3.5 horsepower electrical motor, nor have they innovated with other energy storage alternatives. To this day, all electric golf carts spend five or more hours each day plugged in to recharge, and the entire battery bank must be replaced every few years. THE PROBLEM: Batteries have long been the big issue in the electrical vehicle market. Traditional batteries have high energy density, that is, they can release energy for a long time. But these batteries charge very slowly. Batteries have relatively few charge/discharge cycles, which reduces their lifespan and eliminates using a solar panel to charge. Using a solar panel to recharge actually shortens the batteries useful life. So batteries, whether flooded or sealed lead acid, or lithium, cannot independently repower using only the sun. OUR SOLUTION: Triad Pro Innovators has completely redesigned the golf car mechanically and electrically. Starting with the Triad Pro eCell which has high power density, that is, it can take up and release energy very fast. The Triad Pro eCell with its million charge/discharge cycles unlocks the full potential of a roof mounted solar panel. In addition, the Triad Motor array’s efficiencies complement the eCell’s lack of energy density. By using the lighter, more efficient Triad Motor array, and minimizing the weight of the entire golf car, we can leverage the synergistic strengths of all three components, the solar panel, the Triad Motor array and the Triad Pro eCell. Our patented and proprietary controller circuit board drives the efficiencies of the entire system. 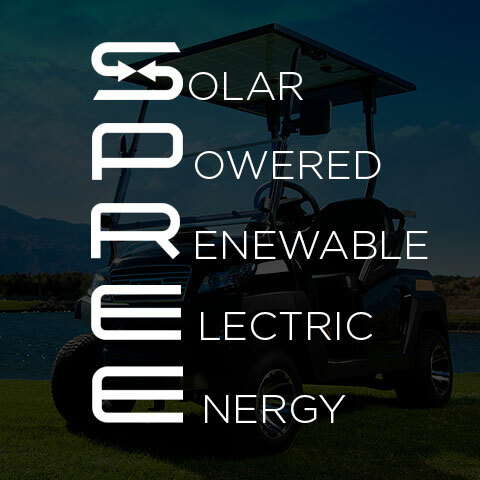 There is nothing like the SPREE golf car on the market today.